Originally published as a Guest Viewpoint in The Register-Guard (Eugene, Oregon), March 6, 2018. Posted with permission from The Register-Guard. Every month, I visit a Eugene pharmacy to buy insulin for my 11-year-old daughter. She has type 1 diabetes, which means her body no longer makes insulin. Without daily insulin injections, she will die. On an Oregon Bronze Affordable Care Act insurance plan, I pay $274 per vial for insulin that cost $21 in 1996. I worry about the price. Oregonians, like other Americans with diabetes, are now making desperate choices to afford the insulin that keeps them alive. State Rep. Rob Nosse, D–Portland, says House Bill 4005—a drug-pricing transparency bill rushed through the Senate last Friday and now headed to Gov. Kate Brown for her signature—will help my daughter and other Oregonians who rely on prescription drugs. “We don’t know,” he tells us, why these drugs are so expensive, but he claims manufacturers alone can explain this mystery. Except I do know why my daughter’s insulin is so expensive. The legal advocacy nonprofit organization I cofounded in 2015—the Type 1 Diabetes Defense Foundation—researched, reported and sued on this issue throughout 2017. I know that insurers, not just manufacturers, are benefiting from high list prices. 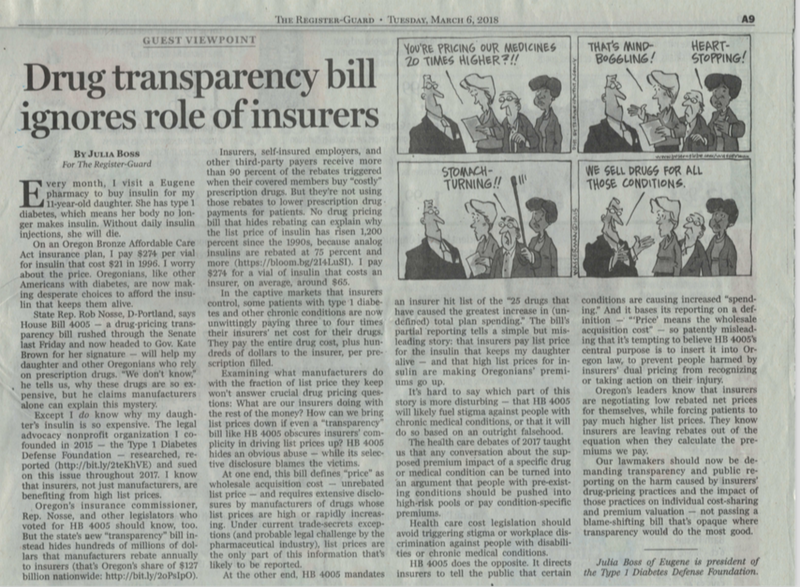 Oregon’s insurance commissioner, Rep. Nosse, and other legislators who voted for HB 4005 should know, too. But the state’s new “transparency” bill instead hides hundreds of millions of dollars that manufacturers rebate annually to insurers (that’s Oregon’s share of $127 billion nationwide). Insurers, self-insured employers, and other third-party payers receive more than 90 percent of the rebates triggered when their covered members buy “costly” prescription drugs. But they’re not using those rebates to lower prescription drug payments for patients. No drug pricing bill that hides rebating can explain why the list price of insulin has risen 1,200% since the 1990s, because analog insulins are rebated at 75 percent and more. I pay $274 for a vial of insulin that costs an insurer, on average, around $65. In the captive markets that insurers control, some patients with type 1 diabetes and other chronic conditions are now unwittingly paying three to four times their insurers’ net cost for their drugs. They pay the entire drug cost, plus hundreds of dollars to the insurer, per prescription filled. Examining what manufacturers do with the fraction of list price they keep won’t answer crucial drug pricing questions: What are our insurers doing with the rest of the money? How can we bring list prices down if even a “transparency” bill like HB 4005 obscures insurers’ complicity in driving list prices up? HB 4005 hides an obvious abuse—while its selective disclosure blames the victims. At one end, this bill defines “price” as wholesale acquisition cost—unrebated list price—and requires extensive disclosures from manufacturers of drugs whose list prices are high or rapidly increasing. Under current trade-secrets exceptions (and probable legal challenge by the pharmaceutical industry), list prices are the only part of this information that’s likely to be reported. At the other end, HB 4005 mandates an insurer hit list of the “25 drugs that have caused the greatest increase in [undefined] total plan spending.” The bill’s partial reporting tells a simple but misleading story: that insurers pay list price for the insulin that keeps my daughter alive—and that high list prices for insulin are making Oregonians’ premiums go up. It’s hard to say which part of this story is more disturbing—that HB 4005 will likely fuel stigma against people with chronic medical conditions, or that it will do so based on an outright falsehood. The health care debates of 2017 taught us that any conversation about the supposed premium impact of a specific drug or medical condition can be turned into an argument that people with pre-existing conditions should be pushed into high-risk pools or pay condition-specific premiums. Health care cost legislation should avoid triggering stigma or workplace discrimination against people with disabilities or chronic medical conditions. HB 4005 does the opposite. It directsinsurers to tell the public that certain conditions are causing increased “spending.” And it bases its reporting on a definition—“‘Price’ means the wholesale acquisition cost”—so patently misleading that it’s tempting to believe HB 4005’s central purpose is to insert it into Oregon law, to prevent people harmed by insurers’ dual pricing from recognizing or taking action on their injury. Oregon’s leaders know that insurers are negotiating low rebated net prices for themselves, while forcing patients to pay much higher list prices. They know insurers are leaving rebates out of the equation when they calculate the premiums we pay. Our lawmakers should now be demanding transparency and public reporting on the harm caused by insurers’ drug-pricing practices and the impact of those practices on individual cost-sharing and premium valuation—not passing a blame-shifting bill that’s opaque where transparency would do the most good. Julia Boss of Eugene is president of the Type 1 Diabetes Defense Foundation.